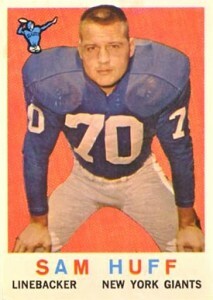 1959 Topps Football was the company's largest to date. With a checklist of 176 cards, measuring the standard 2-1/2 by 3-1/2 inches, Topps showed they were in the market to stay. The set is anchored by a lengthy list of future Hall of Fame players including Jim Brown (#10), Frank Gifford (#20), Bart Starr (#23) and Johnny Unitas (#1) and Paul Hornung (#82), to name a few. The 1959 Topps Football rookie crop includes Sam Huff (#51), Jim Taylor (#155), Max McGee (#4), Alex Karras (#103), Jerry Kramer (#116), Jim Parker (#132) and Bobby Mitchell (#140). 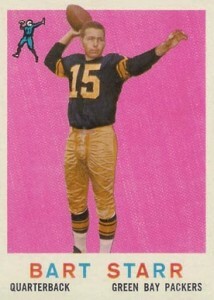 1959 Topps Football cards feature a colorful design with a player photograph that was usually a head-and-shoulders shot, but sometimes a full-body posed image were also used. The player is then superimposed over a fabric-type, solid-colored background. The background colors vary between pink, green, blue and yellow. A team logo is also placed somewhere inside the picture. The white border joins with the bottom area that houses the player's name, position and team. The player's name alternates between red and blue ink with each letter. Card backs feature a football icon with the card number and a black box with the player's name, team and position. Below that are two lines of vital statistics. For some players, a box of year and lifetime statistics appears, while others receive a short biographical write-up instead. Most of the back, however, is taken up by a scratch-off trivia question that has part of the answer image visible. Card backs that have had been subjected to the edge of a coin are, obviously, less valuable than those that haven't. Each NFL team is highlighted with two specialty cards. The first is a team card, which features an oval-shaped background much like they had in 1958 Topps Football. The same fabric-type design of the regular cards is featured as well as the alternating blue-and-red lettering scheme. Backs of the team cards feature a checklist, which doesn't necessarily follow the series the player is a part of. The other team-specific card is a pennant card, which showcases a pennant with the team logo and team name, with a sketched in-game action image underneath. 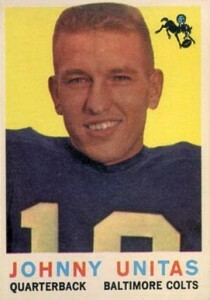 The 1959 Topps Football set was printed in two, 88-card series. In a change from the usual series format, cards from the first series are slightly more scarce and more valuable than cards from the second as the result of being printed in a smaller quantity. The second series printing sheet consists of 132 cards, laid out in 12 rows of 11 cards. Due to the fact that there were only 88 cards in the this series, several of the cards are double-printed with the cards from the top four rows being duplicated on the bottom four rows. Cards from the set were distributed in one-cent and five-cent wax packs, as well as cello packs and vending boxes. 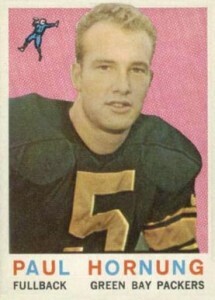 One very noticeable error includes the rookie card of Jim Taylor of the Green Bay Packers. 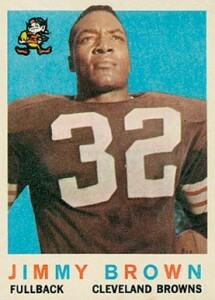 The card identifies the running back, yet shows a different Jim Taylor who played for the Chicago Cardinals. There are also a number of cards that have discrepancies between the front and the back (some involve names, others involve positions), but none were ever corrected and thus have no added value for being errors. Condition issues common to the set are typical for the period including centering, edge wear and toning of the white border areas.